Unifyed has developed the Finance module for the staff and students to impart and acquire the required financial information respectively, as soon as something new is to be notified or as and when needed by the students. With this app, students don’t need visit the finance department for every minor or major piece of information that they want to acquire. Automated, mobile and web friendly solution that simplifies processes for the staff to manage student finances and information broadcast. Financial information including Holds, Account Summary, and more are just a touch away. With an intuitive UI, students can acquire and update emergency information when needed. 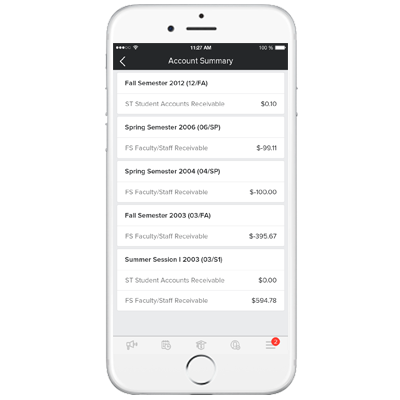 Allows the students to view their account summary for a specific term or a semester. Students are notified of a hold on their account through push notifications. Once the students have completed the process of selecting/dropping classes, this feature helps them track the progress of their application.